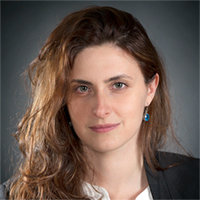 Dr Angela Gallo joined Cass in 2016 as a Marie Curie Fellow at the Centre for Banking Research. The funded project was on Shadow Banking and its implications for the real economy. Angela’s research interests are in the areas of banking, structured finance and corporate governance. Her research has been published in international peer-reviewed journals as Corporate Governance: International Review, International Review of Financial Analysis, Journal of International Financial Markets, Institutions & Money. Angela has teaching experience at undergraduate and postgraduate level. She has designed and delivered modules for the Italian Banking Association, international banks and financial advisors in London. She has delivered seminars and talks for industry events and policy-makers. As a member of the Centre for Banking Research, she is involved in the consulting works of the Centre. She is currently a member of the Board of Studies at Cass Business School. D'Amato, A. and Gallo, A. (2017). Does Bank Institutional Setting Affect Board Effectiveness? Evidence from Cooperative and Joint-Stock Banks. Corporate Governance: An International Review, 25(2), pp. 78–99. doi:10.1111/corg.12185 . Curcio, D., De Simone, A. and Gallo, A. (2017). Financial crisis and international supervision: New evidence on the discretionary use of loan loss provisions at Euro Area commercial banks. British Accounting Review, 49(2), pp. 181–193. doi:10.1016/j.bar.2016.09.001 . Battaglia, F. and Gallo, A. (2017). Strong boards, ownership concentration and EU banks’ systemic risk-taking: Evidence from the financial crisis. Journal of International Financial Markets, Institutions and Money, 46, pp. 128–146. doi:10.1016/j.intfin.2016.08.002 . Battaglia, F. and Gallo, A. (2015). Risk governance and Asian bank performance: An empirical investigation over the financial crisis. Emerging Markets Review, 25, pp. 53–68. doi:10.1016/j.ememar.2015.04.004 . Battaglia, F., Gallo, A. and Mazzuca, M. (2014). Securitized banking and the Euro financial crisis: Evidence from the Italian banks risk-taking. Journal of Economics and Business, 76, pp. 85–100. doi:10.1016/j.jeconbus.2014.02.003 . Curcio, D., Dyer, D., Gallo, A. and Gianfrancesco, I. (2014). Determinants of banks’ provisioning policies during the crisis : Evidence from the Chinese banking system. Managerial Finance, 40(10), pp. 987–1006. doi:10.1108/MF-10-2013-0295 . Battaglia, F. and Gallo, A. (2013). Securitization and systemic risk: An empirical investigation on Italian banks over the financial crisis. International Review of Financial Analysis, 30, pp. 274–286. doi:10.1016/j.irfa.2013.03.002 . Bolognesi, E. and Gallo, A. (2013). The ex-date effect of rights issues: Evidence from the Italian stock market. Applied Financial Economics, 23(2), pp. 149–164. doi:10.1080/09603107.2012.711936 .